Oh wow... I am finally back in the studio (sigh of relief, deep breath, smile). It feels like coming home after a looong absence, and such a deep longing. There is a lot of catching up to do but for today I just want share the joy of creating again! After being away from my art-making for so many months, a huge resistance had been building up and so I needed a project to gently rekindle the spark, get back on track with a daily creative practice, and get some accountability too. So Kellee Conrad's 100 artworks challenge came at a perfect time (and by the way you can still join the fun!) We are a group of over 300 artists, committed to making 100 small pieces of artwork. There is no time frame, so no pressure, and we each choose a type of substrate, a format, a theme and techniques that we are going to keep for the whole challenge (with variations of course). A starting point for a deep exploration process and for creating a new body of work. As a warm up I created an inspiration board on Pinterest, check it out! I'm usually more comfortable painting big, so for me working on small substrates is a challenge in itself. I decided on 8" x 8" MDF panels (so not too small) that are pretty thick. I mounted watercolor paper on some of them because I want to start my first layer with pencil, inks, watercolor etc. And then I will try my hand at encaustics. Which is why I need a porous substrate and NO acrylics (now that is a challenge too!). For my small encaustic pieces I got really inspired by Shari Replogle's "Wax on Wednesdays" tutorials, particularly this one. She has a Youtube channel packed with awesome ideas. I am so excited about the next step! 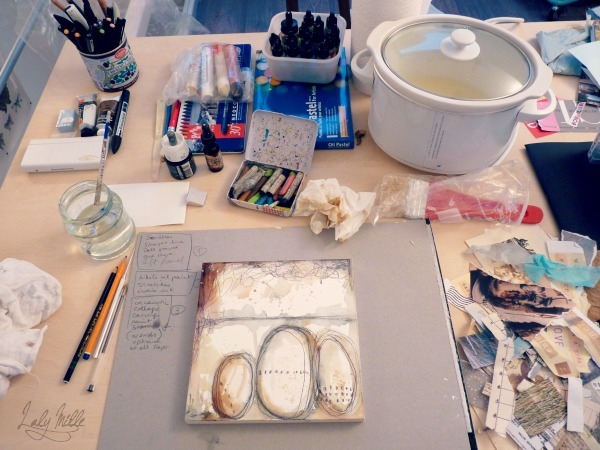 It's going to be encaustic collage! I've always wanted to try it. So I've got my stash of papers ready, my encaustic medium (which I made myself, and I'm not a little bit proud!) and I'll keep you posted... As usual, I'll probably share some pics along the way on Facebook and you are of course invited: https://www.facebook.com/LalyMille.Art It feels so good to be back! PS: I almost forgot! If you haven't already, you can now subscribe to my blog updates and announcements. I'd love for you to join! Just click on the image below. See you soon! A Feast of Art Journaling! A Garden Dream... Free studio session! Make Art for the Earth! Ready for the Next Step! Let your Light shine through your Art! Join over 7000 members of my creative community and get inspiration delivered to your inbox! By completing this form you are signing up to receive our emails and can unsubscribe at any time. Please note: Unless specified otherwise, all content is the property of Laly Mille. Photography: ©Laly Mille and ©Emilie Bernard. Guest articles and images are the property of their respective authors. Please do not use without express written permission. You are welcome to share on social media as long as you give due credit and link back to the original source. Thank you. Laly Mille is a participant in the Amazon Services LLC Associates Program, an affiliate advertising program designed to provide a means for sites to earn advertising fees by advertising and linking to amazon.com.